Just as Wei Luo and Qin-shi arrived at Bamboo Courtyard's main room's entrance, they heard Second Madam saying, "What type of occasion is a palace banquet? Only the capital's respectable women and girls go the palace banquets. How could a girl born from an outside mistress attend? Are you trying to disgrace House Wei?" Qin-shi frowned. She evidently also felt that Second Master's action was very inappropriate. Right after Second Madam finished speaking, Second Master Wei Cheng said, “This is why I wanted to talk with father to quickly give Wei Bao Shan a proper title and add her to our family’s genealogy..."
Second Madam almost fainted from anger. Wei Dong had just married. Second Madam hadn't even recovered from feeling sad and Wei Cheng proposed this type of request. For a split second, Song-shi even thought about divorce! Even Wei Luo felt that Second Master was too muddled. Was there any meaning in his action? Wei Bao Shan was only a daughter born from an outside mistress. Even if she was included in House Wei's genealogy, her status wasn't honorable. The proper young masters and ladies in Duke Ying's residence all felt disdain towards her. Wei Luo thought for a moment. 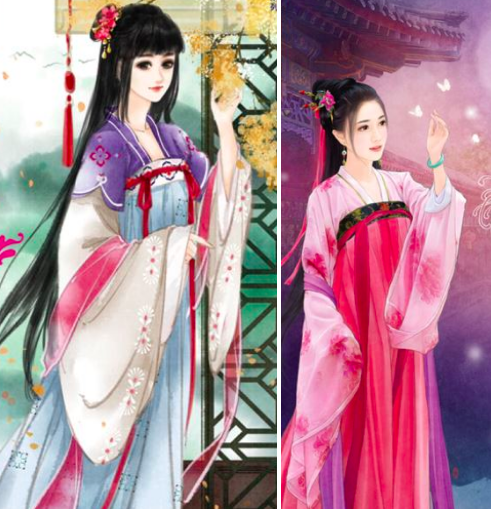 Second Master wanted to let Wei Bao Shan attend the palace banquet, so that she could show her face in public and have a chance at a good marriage partner. For him to be so muddled-headed, it seemed like this daughter had bewitched him. Even if she appeared in a public gathering, nothing would change. She was a daughter born by an outside mistress that shouldn't see the light of day. The aristocratic families that accumulated wealth over a long period of time and knew the truth about her status wouldn't be interested her. Even if they were interested in her, it wouldn't be as a legal wife. At most, she would only be a concubine. It would better if she obediently married into an ordinary family. This way, she would have a say in her husband's family. Wei Luo and Qin-shi walked into the main room and saw Wei Bao Shan, who was standing on the side. Wei Bao Shan was wearing a white silk jacket and a violet silk skirt. Her simple and unobtrusive style of dress made the fragility of her character seem even more apparent. It was easy to find her pitiful. Her head was lowered and her eyes were red. Sensing that someone had come into the room, she only looked up for a moment before lowering her head again. Second Madam was tired from arguing. She had sat down on rosewood chair to rest. Qin-shi walked forward to comfort Song-shi. "Dong-er has only recently left. Second brother-in-law and second sister-in-law, why are you fighting? What can't be calmly discussed? Is there a need to have such an unsightly argument?" At the mention of Wei Dong, Song-shi's eyes became red. In the end, Wei Dong was her biological daughter. Her wedding had only been a few days ago and she missed her tremendously. "Do you think I want to argue? If he didn't bring up this type of request, why would I ..." Then, she covered up her eyes and didn't continue talking. Wei Cheng was also feeling angry. He didn't respond to her words. Without any warning, Wei Bao Shan walked in front of Song-shi and kneeled down. She tearfully said, "Madam, if you're angry, then direct your anger at me... Father only said those words for my sake. If mother didn't die of illness and I had a place to stay, father wouldn't have brought me to Duke Ying's residence and offended your eyes..."
Song-shi was born in an aristocratic family and had good upbringing. She could achieve the prestige of a legal wife. Hearing Wei Bao Shan’s words, she rubbed her eyes, coldly stared at her, and said, "Who are you calling mother?" Wei Bao Shan had gotten used to calling her biological mother, “mother”. After coming to Duke Ying's residence, she still hadn't changed how she addressed her biological mother. Who didn’t know that this was taboo? Under the strict rules of aristocratic families, only the legal wife could be addressed as "mother". Wei Bao Shan stagnated for a moment. She quickly changed her words, "She's.... Lin-shi." Lin was Second Master's outside mistress's last name. It goes without saying that Second Madam rarely saw Bao Shan and wouldn't show any mercy when she did talk to her. "Your knowledge of rules is this lacking. If you attend a palace banquet, wouldn't people laugh at House Wei?" Unexpectedly, Song-shi’s words were very reasonable and left no room for other people to refute. Wei Bao Shan shrunk her shoulders. She didn't say a word after this lecture. After Wei Cheng calmed down, he thought that Song-shi's words were reasonable. Wei Bao Shan's upbringing and etiquette truly wasn't equal to other young ladies. If he wanted her to marry into a good family, she needed strengthen her knowledge in this area. His gaze fell on Wei Luo and he suddenly had an idea. "Ah Luo's knowledge of etiquette is the best. I often hear father and mother praising her. Ah Luo, how about you teach Bao Shan?" Wei Luo had originally been standing at the side watching the excitement. She hadn't expected that conversation would suddenly turn to her. She froze for a moment, then she refused, "I have to go to Mister Xue's and Madam Han's for classes. I don't have free time..."
Even Qin-shi didn't agree, "Ah Luo is busy preparing for her wedding. Second brother-in-law, don't inconvenience her." Wei Cheng was unwilling to give up. He continued trying to persuade her. In the end, seeing that Qin-shi was resolute, he had no choice other than giving up this idea. Qin-shi naturally wouldn't let Wei Luo be mixed up in this muddy water. A glance showed that Wei Bao Shan had many intentions. She didn't want Wei Luo to have much contact with this person. After they came out of Bamboo Courtyard, even a woman like Qin-shi, who had a good temperament and upbringing, couldn't help frowning and saying, "Second brother-in-law is becoming more and more muddle-headed. Walking next Qin-shi, Wei Luo didn’t say words of disagreement. In the blink of an eye, it was already September 8th. The banquet arranged by Emperor Chong Zhen to entertain Wu Rong's emperor was today. The palace banquet was held at Rong Hua Hall, which was next to the western pond. There were a hundred and eight tables inside the hall. The occasion was very grand. It could be seen that Emperor Chong Zhen was paying absolute attention to the diplomatic relations. After all, this negotiation was related to the common people at the borders and even the stability of Da Liang for the coming decades. Wei Luo followed her family into the palace. She was wearing a short pink top with scattered flowers and a simple, light green gauzy long skirt. Her style of dress wasn't too outstanding. It was because it was clear in everyone's mind that diplomatic relationships between two countries could only happen by becoming allies through marriage. Standing out would only result in being punished. Whoever wanted to go to Wu Rong could stand out. (T/N: Poor Bao Shan. She recently lost her mother and hasn’t done anything wrong. Their behavior feels very hypocritical when Wei Cheng and Song-shi were born from concubines too and Wei Cheng’s mother was originally Old Madam’s servant girl. It’s understandable why Song-shi hates Bao Shan, but it’s really unfair that everyone else is automatically disdainful of Bao Shan because of who her mother was. Wei Cheng was the one who decided to cheat on his wife. Plus, we don’t know when Wei Cheng and Bao Shan’s mother’s relationship started. It’s possible that their relationship started before Wei Cheng was married to Song-shi and they just had Bao Shan later. Maybe, he thought he would have the freedom to pick his wife and marry Bao Shan’s mother because he wasn’t the legal wife’s son. I originally thought he was wrong for having an outside mistress instead of telling Song-shi the truth and bringing her back as a concubine after Bao Shan was born. But if Bao Shan’s mother didn’t die, then maintaining this lie would have left everyone happier. I think it’s good that he’s taking responsibility for Bao Shan’s future. What do you guys think? This story makes me feel so conflicted.